At Skullcandy, we believe in the power of music to help people reach their highest potential. As an athlete, I used music during every aspect of training from daily warm-up and comp day preparation to improving on-hill focus. I used it in the gym to pump myself up, to relax and cool down during recovery sessions and to enhance flow during yoga. I even used it to get to sleep when the pressure of a morning competition was all consuming. When I crashed a jump, I would listen to music to get back to the right attitude for the next jump, or to prepare myself for a new skill. 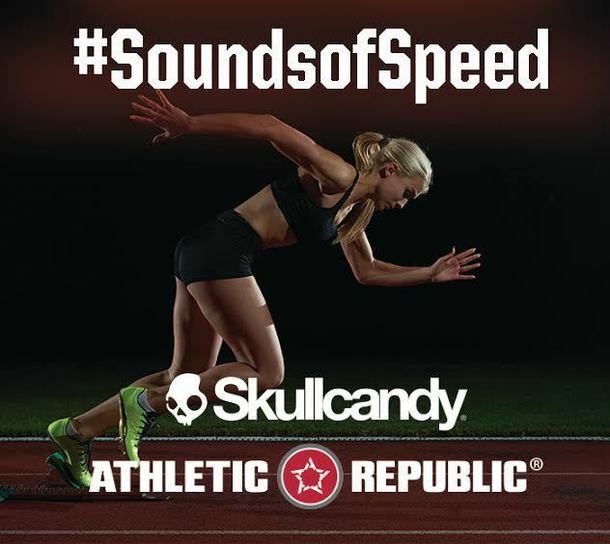 ; At Skullcandy, we use music to help our athletes reach their peak performance both in and out of the gym. Research has shown that listening to the right music during a workout can increase an athlete’s performance by up to 20%. During a big workout, music can distract from pain, reduce feelings of fatigue, elevate mood, increase stamina, decrease perception of effort and can even improve warm-up and accelerate recovery. When listening to music people tend to push harder, run faster and bike further. The Sounds of Speed make working out more fun and help push an athlete to the next level. Reaching our highest potential takes grit, hard work and pushing past what we once had perceived as our own boundaries. It also takes special attention to every small detail of training. All of the world’s best athletes have felt the pain of hitting the wall, and while sleep, conditioning, nutrition and hydration certainly help, a less known performance accelerator is the music we listen to everyday. Matching the cadence of a song to the beat of a runner’s steps can help to maintain motivation and stamina during a big workout, and increasing that beat by up to 5% can help to accelerate a runner’s speed as well. Since, most athletes jog between 150 and 160 steps per minute, matching that cadence is a fun way to make a run seem easier and more fun. One way to do this is to create a playlist that matches each runner’s perfect cadence using an app such as Mixed in Key Mashup or other DJ software, or an even easier option is to use one of the apps out there that will do it for you, such as our favorite Rock My Run. Spotify and Pandora are also good musical outlets for any athlete. A few other tips. To help an athlete create more power, turn up the bass. A recent pilot study showed results trending towards a more explosive performance when athletes listened to music with higher bass tones. When working towards skill development, less familiar music with a repetitive beat and less obvious lyrics such as EDM or Dub Step can be helpful. Timing is Key. A recent project in the Skullcandy Sport and Human Potential Lab, showed that athletes who warmed-up with music were able to increase their relative power during an aerobic capacity bike test by an average of 7%, demonstrating that not only is music effective during a workout, but before as well. At the end of the day, a solid recovery will help an athlete return ready to charge the next morning. Motivational music during an unstructured recovery has been shown to decrease lactate levels and additionally by slowly decreasing the beats per minute in a playlist we have seen that heart rate will also decline more rapidly. By listening together, music can enhance team cohesion and get athletes ready for game day. The Baylor Football coaching staff understands this concept and plays music throughout each practice to energize the players and get them ready for the deafening noise of the game day. When loud music is played during practice the stadium can seem peaceful in comparison. Music is always catered to the players’ choice, and tend to be mostly rap, hip-hop and heavy metal. If your athletes are more often teenage girls, or older adults, plan to choose your music accordingly. If you’re stuck, ask them what has them feel their best, and plan your playlist accordingly.Thinking about the music your athletes are listening to everyday makes a difference. By catering music choices to each workout and your athletes’ tastes, you can ensure that each of them will work harder, have more fun and come back for more. 1.Terry P, Karageorghis C. Psychophysical effects of music in sport and exercise: an update on Theory, Research and Application, In: Psychology Bridging the Tasman: Science, Culture and Practice, 26-30 Sep 2006, Auckland, New Zealand. 2.Bridging the Tasman: Science, Culture and Practice, 26-30 Sep 2006, Auckland, New Zealand. Eliakim, M. Effect of Rhythm on the Recovery from Intense Exercise: Journal of Strength ; Conditioning Research, 1019-1024 April 2013.